Sometime in the last few weeks, Nanjing city authorities started to put police officers on some public buses. As with many individuals who work in local government positions, the officers one meets on these bus routes are not reticent to speak of their role, providing someone takes an interest and actually asks them about their work. Indeed, as in this instance, they’re eager to inform, and they do so with politeness and professionalism. The police officers are working in pairs: one in front of the bus where residents board; the other is sitting in the back seat. The one in the front is meant to deter people who might have a nefarious purpose from getting on the bus in the first place. Their partner in the rear of the bus keeps their eyes on passengers who might cause trouble once they do board—for example, an argument that gets out of hand, pickpockets, and the like, or someone who manages to board with, say, hazardous materials that aren’t immediately apparent to the officer at the front of the bus. The officers aren’t present to maintain order or civility per se, but to protect passengers against possible threats. The officers are armed—which is to say, they say that they are 配备—“equipped” or “deployed” with the means to handle problems. At the same time, they do not seem to be carrying guns (武装的), though they do have holsters, which appear to be holding mace and some sort of stun device or a short truncheon. The demeanor of these officers is by no means threatening or intimidating: They seek to convey their seriousness simply by their presence on the bus. And they’re not on every bus route, by any means. Thus far, police officers appear to be riding only on some of the longer routes—ones that go across the city and start from the far end, making many stops at subway stations that feed in from Nanjing’s outskirts. One officer allowed that there was concern with “people coming in from the countryside who have a gripe with the government” and might wish to cause harm. There’s also a safety issue, he noted, with farmers or laborers carrying gasoline, kerosene, or other materials that they plan to use privately but which could cause a danger to bus riders or residents along the same route. 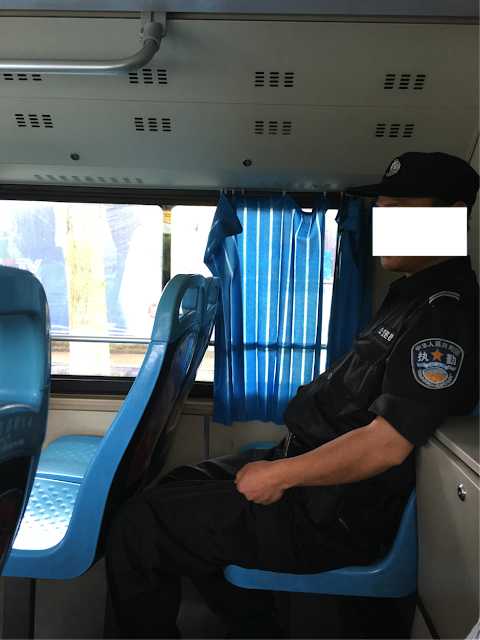 By placing officers on such buses, Nanjing city authorities clearly hope to preclude such problems. As with everything local in China, there are larger issues about this situation that deserve reflection. For one, there hasn’t been a public announcement of this new policy. But it appears to be the result, one officer related, of incidents earlier this year in Shanghai, Shenzhen, and Chongqing, when explosions occurred on public buses. Those events occurred some months ago, however (March and April). So the decision to put officers on some bus routes in Nanjing may be a grudging response to a central directive from Beijing to do something--another example of the glacial nature of local policymaking in China when Beijing itself tends to be sluggish in making decisions. Nanjing officials might not be opposed to what Beijing wants, but they’d like to have a clear sense of what precisely that is before acting. It’s also possible that officials here have information about discontent outside Nanjing that’s become worrisome. With Beijing more focused on protecting the political leadership from possible terrorism there, it’s been largely left to local governments to deal with indigenous disgruntlement—an approach that some officials in Nanjing prefer anyway, because they know their backyards better and the sorts of threats they face aren’t usually large-scale anyway. The fact that it’s only a few bus routes where police officers are riding—and evidently always in uniform—hints that there may well be concern with something specific to this area. At the same time, according to Nanjing local news, there’s at least another reason for bus riders to be alert this summer: Women wear less clothes, and therefore (the story claims with dubious logic) there are increasing incidences of groping and other forms of inappropriate behavior by male riders on public transport. Some problems, it appears, aren’t local at all.